For audiences up to 500 people, rent fast-fold projection screens to give a meeting a polished, highly professional look. 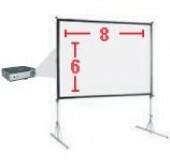 Professional fixed frame screen rental, for audiences up to 150. Front or rear screen projection for maximum impact. A great fixed screen rental for many ballrooms. Front & rear screens available, perfect for audiences up to 200. A big screen rental that makes a big impact on audiences up to about 300 people. Front & rear screens available. The complete 6' x 8' projection screen with dress kit rental. 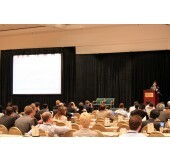 Professional elegant screen for conferences and events with space contsraints. 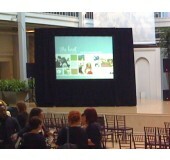 The complete 7.5' x 10' projection screen with dress kit rental. Most popular size screen for conferences and formal events. The complete 9' x 12' projection screen with dress kit rental. The perfect professional look for large conferences and events.